An England where people who are wicked in thought or deed are marked by the Smoke that pours forth from their bodies, a sign of their fallen state. The aristocracy do not smoke, proof of their virtue and right to rule, while the lower classes are drenched in sin and soot. An England utterly strange and utterly real. An elite boarding school where the sons of the wealthy are groomed to take power as their birthright. Teachers with mysterious ties to warring political factions at the highest levels of government. Three young people who learn everything they’ve been taught is a lie—knowledge that could cost them their lives. A grand estate where secrets lurk in attic rooms and hidden laboratories. A love triangle. A desperate chase. Revolutionaries and secret police. Religious fanatics and coldhearted scientists. Murder. A London filled with danger and wonder. A tortured relationship between a mother and a daughter, and a mother and a son. Unexpected villains and unexpected heroes. Cool reason versus passion. Rich versus poor. Right versus wrong, though which is which isn’t clear. 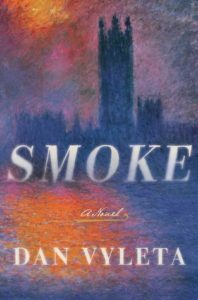 Dan Vyleta’s Smoke is what you would get if you crossed Henry James with Philip Pullman and is set it in some post-apocalyptic Victorian-ish England in which Smoke is the manifestation of humanity’s emotional existence – the soul, the spirit, some other sublime aspect of ourselves. London itself is a cesspit of Smoke and Soot, running rampant with all sorts of behavior. There is a lot of interplay with levels of class, with the ideas of right and wrong, and with adhering to social expectations of propriety or letting go and running with base emotions. Smoke is never fully defined with no origin story or full resolution by the end. Readers looking for a solid beginning and end will not find that here. Smoke is something that came into existence a few hundred years before this story began, and society’s leaders rewrote history to include the existence of Smoke as if it has always existed. The upper class are allowed to rule and govern because they are pure and restrained, while the lower class must rot in Soot and Smoke. But it’s discovered that the upper class, especially the ones who control the power with money and influence, have ways in which to control the Smoke through special candies developed to absorb all release of the body’s Smoke. Conversely, the upper class have devised a cigarette in which one can enjoy the pleasures of Smoke without entirely being consumed by it (at great expense, of course). Three school-aged people – Thomas, Charlie, and Livia – discover the lies in which their society lives and go to great lengths to find some kind of resolution. It might seem a bit anticlimactic to those who are unfamiliar with British literature and/or culture or the Gothic genre, but it is quite liberating if one is on the side of the young ones. Embracing the Smoke, ultimately embracing emotion (passion, anger, yearning, courage, etc. ), is where one finds personal freedom. I should add that the description advertises a love triangle. Without any spoilers, it’s the first time I’ve been wholly pleased with the outcome of that love triangle at the end. Writers, take note. 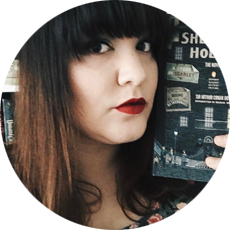 Vyleta’s immensely detailed descriptions evoked that style of Henry James, the social commentary reminded me a bit of Dickens, and the use of the elements and religious tyranny with children discovering the truth reminded me of Pullman. Stir in a pinch of Collins, a dash of Doyle, and a handful of soot, and you’ve got Smoke. It’s one of the best books I’ve read all year. Thanks to Edelweiss for the review copy!